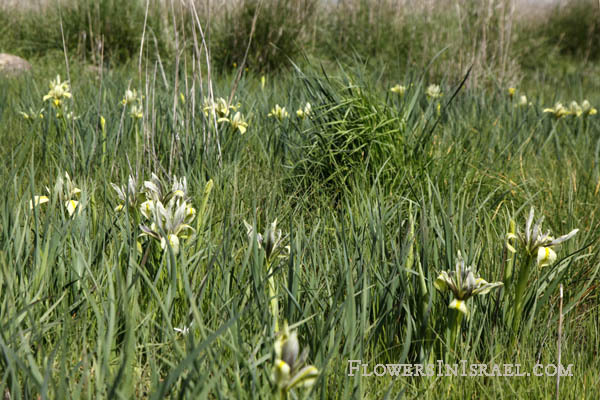 Synonym name: Iris melanosticta Bornm. Flowers: Yellow, Greenish-yellow, tube 7mm long; falls 6-7cm long, with purple to lilac veins; standards 5cm long, erect, and narrower than the falls. grant-duffii, named for Sir Mountstuart Elphinstone Grant Duff (1829 - 1906), known as M. E. Grant Duff before 1887 and as Sir Mountstuart Grant Duff thereafter. Baker gives the following in Curtis's Botanical Magazine. 124: tab. 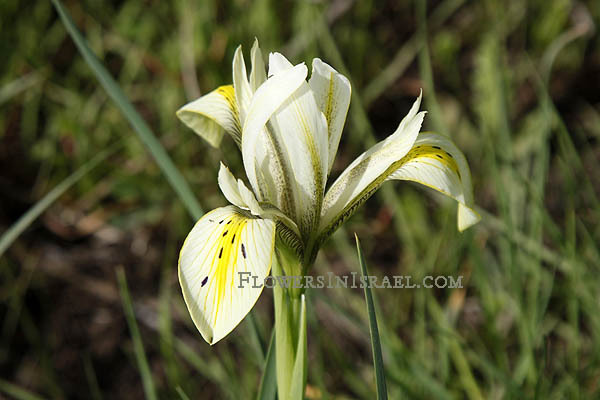 7604; 1898: "This very distinct new Iris was first collected, so far as our records show, in 1864, by Mr. B. T. Lowne on the banks of the river Kishon. 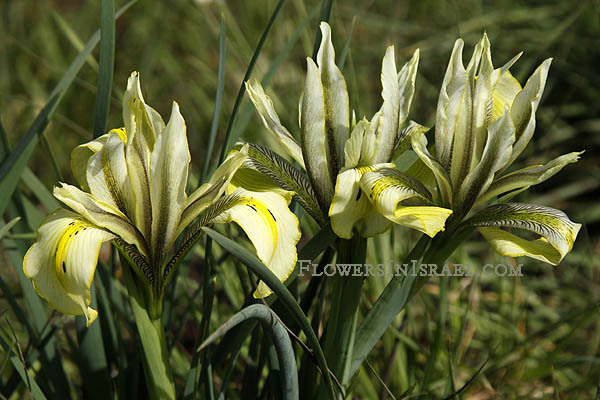 Several years later it was found by Sir M. E. Grant Duff in the plain of Esdraelon, recognized as a distinct species, and introduced into cultivation". melanosticta, μελαϛ melas, black; stictos, spotted, dotted; black-spotted. 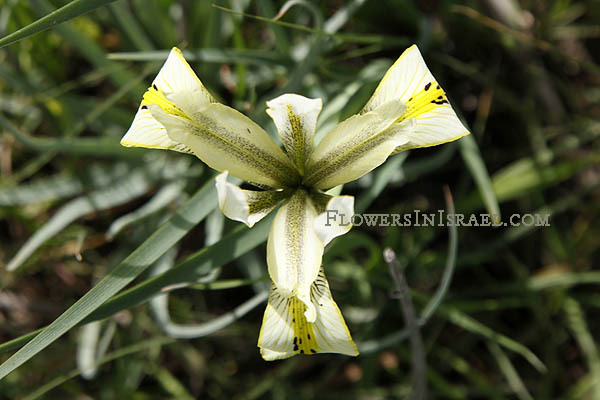 "Irus ha-bitzot", the swamp iris, the Hebrew name derives from its habitat of marshy areas. The standard author abbreviation Baker is used to indicate John Gilbert Baker (1834 – 1920) , an English botanist. 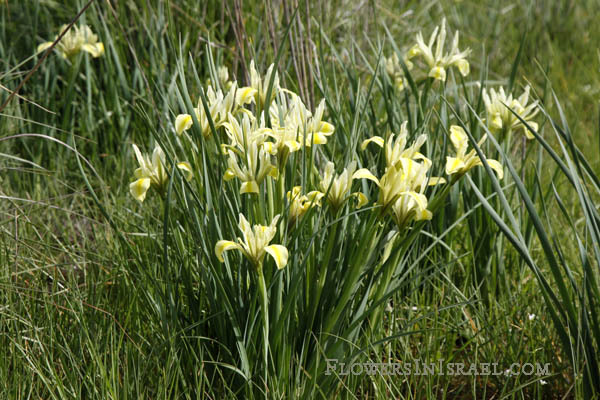 The genus Iris has several subgenera, and the Limniris is one of them; beardless irises, growing from rhizomes.